we create, and we may be too slow to do anything about it." Agriculture (Field Culture) and Aquaculture (Water Culture), developed together - partners until the late Medieval Period when they drifted apart. hi-tech farming and harvesting methods to produce enough food to feed the growing human population. Whilst population and food production growths continue, land and water are at risk of being over-worked. "We need to be quicker to learn, quicker to adjust our actions, and quicker to teach better methods of food production so we can sustain quality living for the total earth biomass, long term." The religion of the Ancient Persians, Zoroastrianism, forbad the discharge of any filth into rivers. This seems to be a great rule - pity we didn't stick to it. 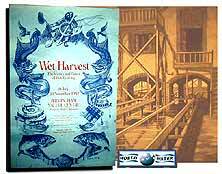 We last looked into the History of Aquaculture when co-authoring the book "Monastic Ponds in Medieval England" with World of Water volunteer, Anthony Casey in 1995 (ISBN 1-899573-01-1). King Ethelred forbade the sale of young fish to allow stocks to rebuild. King Malcolm II fixed the times and conditions under which salmon fishing was permitted. At this time, a report on the problems of Benthos accumulation under Salmon Sea Cages was sent to us for Comment. Since this time, some have recommended limiting the amount of farmed salmon we eat from areas where production standards are poor. So what's to be said ... "quality Farmers produce quality food so buy from quality farmers" [?] - nothing new in that ! There is one total solution to this, and that's "People Power"
Buyers be vigilant. Find out about what you are buying and how it has been produced. Get involved and become an ethical consumer. Work out what your ethics are - let them guide you. The introduction of modern water-carriage sewage disposal in towns and cities legally transferred filth from streets to the rivers and on to the seas. This is the "out of sight, out of mind law. Until there is a lot more information available on all products, this can be a bit of a challenge but help is on its way. 'Hew the Human' cultures food in captivity but is never satiated. There's news that a 'Buying Mate' is being developed. It will probably be some small personal product scanner, with buttons and display screen of course. The River Pollution Act made it an offence to discharge solid or liquid sewage including any poisonous, noxious or polluting liquid from any factory manufacturing and mining process. Ahh, the good old days ? Users can key in all their personal and ethical purchasing standards then scan all coded products in the scheme to see if they match these requirements before buying. At the moment, buyers can look up product and company details on the internet but this takes time and not all Companies are as forthcoming with information as for example Hubbards in New Zealand. Whilst organisations such as the Soil Association and the Marine Stewardship Council oversee and monitor the quality of some products on retail shelves , too few farmed and wild food harvesters join such schemes. Full consumer information needs to be available for ALL products if we are to be able to buy wisely using self written guidelines/ ethics. Pollutants regularly get flushed down plug holes nowadays. This needs to stop and we need to change all "out of sight, out of mind" attitudes. Human Populations are growing and we are getting very good at staying healthier for longer but this has a knock on effect. Bigger populations need more food but this needs to be healthy food from a clean environment, wild caught or farmed. It doesn't matter if your breakfast comes from a wild harvested origin or a cultivated farmed one, you still need to eat happy, knowing the food is the best it can be. You don't drink unclean water and you don't want to risk food that grows in unclean water conditions. The World Clean Water Campaign must be won so natural and farmed foods grow well and healthy in clean and safe surroundings. We musn't stomach pollution - literally! You need healthy food to stay healthy yourself, whether you are fond of picking and eating crisp (water full) succulent vegetables or catching and cooking something a little higher in the food chain - or lower if you enjoy micro-diets. No wild or cultivated food benefits from pollution during its grow and though you might feel it is OK for dead uncooked chipped potatoes to swim in harmless whitening chemical before being fried, you don't want the living potato getting anything short of uncontaminated clean water during its lifetime. When something goes 'wrong', unless it is a natural catastrophe, it is OUR FAULT - we humans love to be 'the top species' on 'our' Planet, so if we are the bosses around here then the buck stops here with us. We have to put things right - all of us. It's a big job and therefore it needs everyone to do their share to win this Campaign. 'Free' food, at a cost. that 'Nature' continues to provide much of Hew's growing requirements. We need to improve our track record if we are to win the human race and reach a perpetually sustainable future.
' bit by bit '. The Visionaries that say, "if we keep dumping a cocktail of chemicals into the Water Cycle - what goes around will come around" are on the right track as pollution builds up gradually. Mother Nature, able to rescue us from ourselves. It cannot clean the World's Water for everyone because it cannot cope with the kind of pollution humans now throw at it every day.